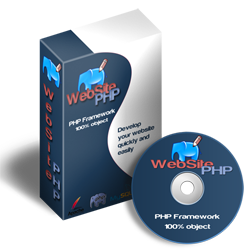 Welcome to WebSite-PHP, the 100% object PHP FrameWork. 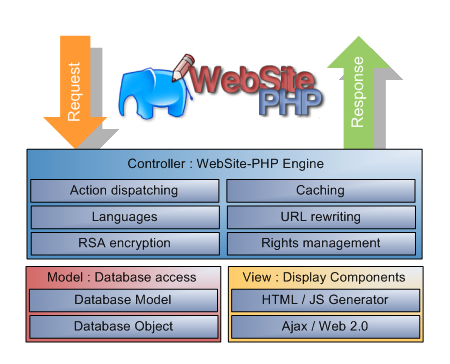 WebSite-PHP is an easly Framework on PHP >=5.2 (compatible with PHP 7) and compatible with the databases MySQL + MariaDB. With his 100% object programming you have a maximum reusability of the framework components and your job. WebSite-PHP and write your first page "Helloworld". The version 1.2.15 of WebSite-PHP is available (Release date: 10 February 2018). Note: It's the PHP framework that has an MVC architecture, not your code. Code written for the FrameWork WebSite-PHP will be close to a DotNet code, first for its development 100% object and the other by his events side. Your page will be built by the differents WSP objects you used.